A book comes along like this once in a lifetime. You read it as a small child, or even as a adult, and never forget the images it conjures up, of a wonderful Englishman who lives in the mysterious forests of faraway Burma and of the kind native people who teach him about their lovely country. But most of all, you never forget the elephants! For this is a story about thoseA book comes along like this once in a lifetime. You read it as a small child, or even as a adult, and never forget the images it conjures up, of a wonderful Englishman who lives in the mysterious forests of faraway Burma and of the kind native people who teach him about their lovely country. But most of all, you never forget the elephants! For this is a story about those magnificent creatures. Though he was officially known as Lt. Colonel J.H. Williams, the author was known to the world at large as “Elephant Bill”. That is because he spent 25 years living with the elephants in the mountains and forests of Burma. There he trained them to haul teak logs out of the isolated jungles.Yet this is also a story of great courage because when the Second World War struck, it also came to Burma. The Japanese Imperial Army planned to confiscate the Burmese elephants, drafting them to make the bridges and railways they needed to invade India. When he learned of these plans to put his beloved animals to a war-like purpose, Elephant Bill knew what had to be done. 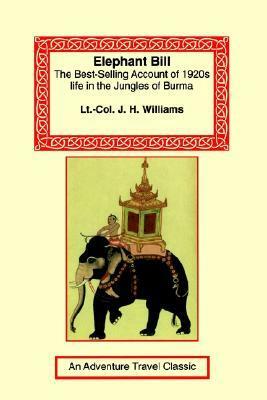 The mighty kings of the jungle had to be evacuated to safety.Personal story of Colonel Williams' adventures in Burma. A bit tedious but quite interesting to read about his involvement with working elephants. first part quite technical about elephant behaviour in captivity and how to manage them. Second part more narrative about the invasion of the Japs during WOII and de evacuation of the elephants from Burma to Assam. Interesting, though more a chain of short stories/anecdotes than a romance. The style reminds me of the narratives a "Some Experiences of a New Guinea Resident Magistrate". Medium to slow read.Williams also wrote a Spotted Deer, which in my recollection, I found better. This book falls into two halves. The first half deals with Williams's experiences working the teak forests in Burma with elephants. It covers how they broke wild elephants for work (really!) and the later breeding programme. The second half is about his WWII expereinces and how he trekked his elepahnts out of Burma and into India as they were too valuable to be left to the Japanese. A young British man with a little veterinary training goes forth into the jungles of Burma to learn how to care for elephants. They give him an education in return. Through peace and war, up and down over mountains and in valleys, through the monsoons and the dry. Absolutely fascinating, a must for anyone interested in elephants - and why wouldn't you be?